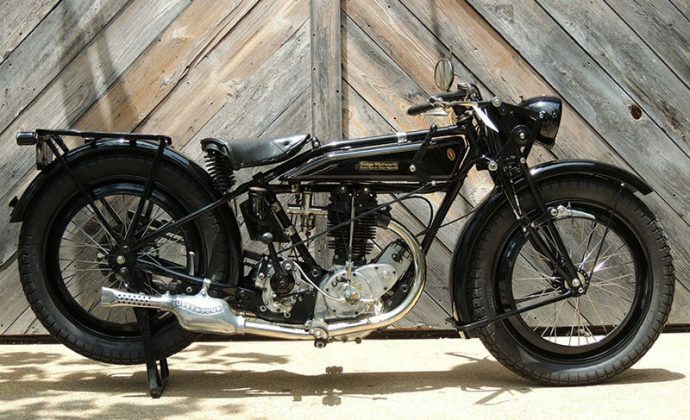 While today the Rudge name is largely forgotten amongst motorcyclists, the Rudge-Whitworth company was a huge force in British motorcycling, as well as automotive wheel manufacture. ‘Rudge’ wheels were among the first ‘knock-off’ competition wheels, and they licensed their design of flanged aluminum wheel rims to the Italian firm Borrani, who supplied sporting/racing rims to most of the Italian car and motorcycle makers around the world. Rudge-Whitworth was founded in 1894 through the merger of two bicycle makers, and moved into motorcycle production in 1911. Competition was always part of their strategy, and the firm was winning races at Brooklands and the Isle of Man for the next 20 years. Their technical innovations included the ‘Multi’ belt drive system, which gave 21 ratios through compensated expanding pulleys, and by 1924 they offered OHV engine with 4-valve cylinder heads for the road, which included a 4-speed gearbox, long before other makes adopted either! 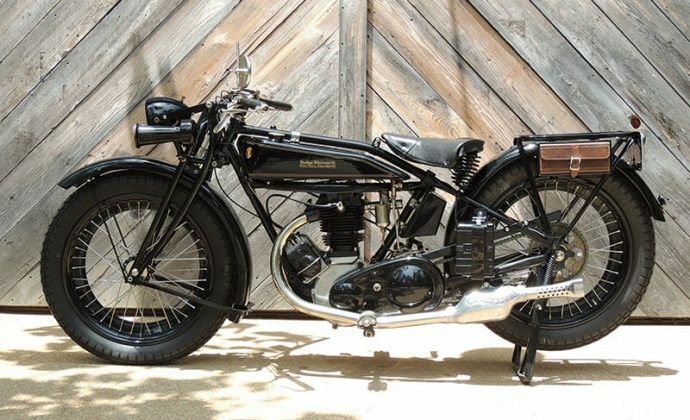 The ‘4-valve, 4-speed’ Rudge was increasingly a force to be reckoned with on the race track, was the last pushrod OHV bike to win the Isle of Man TT, in 1931. Rudge also invented the concept of ‘touring accessories’ in a big way, supplying a full-size camping trailer and even a full-size Canadian-built canoe on a sidecar frame! Their ‘Rudge Book of the Road’, published in 1931, remains a charming snapshot of pre-War touring pleasures, complete with maps and recommended campgrounds. This 1927 ‘Special’ is a 500cc 4-valve, 4-speed machine with a few extras for the model, like a Terry saddle, a special oil pump, and electric lighting supplied by an ML ‘Maglita’ magneto-generator. The Rudge was a technically sophisticated sports-tourer, a smooth and fast machine, among the very best of British middleweights.